A long sought-after data point critical to the non-classical cation story has finally been obtained. The elusive x-ray crystal structure of a norbornyl cation was finally solved.1 The [C7H11]+[Al2Br7]– salt was crystallized in CH2Br2 at low temperature (40 K). 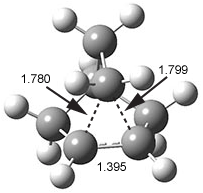 This low temperature was needed to prohibit rotation of the norbornyl cation within the crystal (the cation is near spherical and so subject to relatively easy rotation within the crystal matrix) and hydride scrambling among the three carbons (C1, C2, and C6) involved in the non-classical cation structure. The authors report a number of different structures, all very similar, depending on slight differences in the crystals used. However, the important features are consistent with all of the structures. The cation is definitely of the non-classical type (see Figure 1) with the basal C1-C2 bond length of 1.39 Å similar that in benzene and long non-classical C1-C6 and C2-C6 distances of 1.80 Å. These distances match very well with the MP2(FC)/def2-QZVPP optimized distances of 1.393 and 1.825 Å, respectively. Figure 1. X-ray structure of norbornyl cation. (1) Scholz, F.; Himmel, D.; Heinemann, F. W.; Schleyer, P. v. R.; Meyer, K.; Krossing, I. "Crystal Structure Determination of the Nonclassical 2-Norbornyl Cation," Science 2013, 341, 62-64, DOI: 10.1126/science.1238849. The B3LYP/6-311G(d,p) structure of the norbornyl cation is shown in Figure 1, and this structure is little changed when reoptimized at PBE1PBE/6-311G(d,p) or CCSD/6-311G(d,p). Application of the topological method (sometimes referred to as atoms-in-molecules or AIM) reveals a bond path network that resembles the bicyclo[3.2.0]heptyl cation C. The C1-C2 distance is 1.75 Å and a bond path does connect these two atoms, though the density at the bond critical point is only 60% the value at the other C-C bonds in the compound. There is no bond path connecting C1 to C3 that would close up a three-member ring. The C1-C3 distance is 1.955 Å. So, the non-classical structure is not a proper description of this unusual species. Figure 1. B3LYP/6-311G(d,p) optimized structure of the norbornyl cation. (1) Werstiuk, N. H., "7-Norbornyl Cation – Fact or Fiction? A QTAIM-DI-VISAB Computational Study," J. Chem. Theory Comput., 2007, 3, 2258-2267, DOI: 10.1021/ct700176d.